I write this a few minutes after finishing the book. Sitting in front of my computer I am bemused by much about this book. W. Somerset Maugham is very well known. He died at the ripe old age of 91 and was a very colourful character. He wrote many plays and books, as well as peppering periodicals with articles. Somerset Maugham was very well known and sometimes has four plays showing at once. Somerset’s brother, Frederic Herbert Maugham led a distinguished career as a barrister and judge, also serving as the Lord Chancellor for over a year. The brothers were vastly different with incredibly differing viewpoints and didn’t get on at all well. It seems they got on much better when they didn’t speak. This is an amazing book. If you’re a fan of Somerset Maugham then this is a must read. It gives an incredible insight into the man who became the writer. 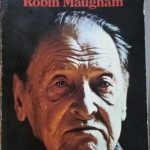 Robin Maugham has shown how Somerset Maugham came into being. What he was like as a child and what his childhood was like. We’re shown with good prose how both he and his brother felt about each other and how Somerset felt about being left with his uncle after the death of his mother. If you’re a genealogy nut then it’s a really good genealogy book. Although there are issues. A real genealogist would notice people mentioned in passing and want to follow up the information. Robin has decided to keep the narrative mostly about his father and uncle and not sidetrack us with irrelevancies. And there’s another however here. However, Robin does go back as many generations as he possibly can. We get stories about as many of his ancestors as he could possibly put in. But these stories are cleverly interspersed with his more recent stories. It makes the narrative feel as if we’re being gradually drawn in through the generations to show Somerset and Frederic and how each generation has shaped them. One of the things which I found a glaring hole was the little information we were given about Somerset and Frederic’s brothers. There were two other brothers, mentioned within the pages and also shown in the family tree at the beginning, but we see very little of them. I kept waiting for more and it wasn’t forthcoming. But why the bemusement? After finishing the book I did a bit of searching and realised I’ve read absolutely nothing by Somerset Maugham. In other words I’ve read an biography about an author I’ve not read. I find myself somewhat amused by that. The other thing that amuses me is the format. There are Footnotes, incredibly brief ones. Then there are Endnotes, some very brief and others quite lengthy. After the Endnotes I found the Appendices and this is followed by an Index. In the Appendices there are Footnotes. I followed correctly and read the Endnotes and Footnotes in the right places, but the Appendices I read all at once. I do recommend this book, if you can find it. A nicely written book but not available nearly as easily as some of Somerset’s books. I’m now very curious about Somerset’s works. According to this book they are heavily autobiographical and I’m sure I’ll recognise some of the characters from this book. Sounds interesting! I love biographies and memoirs, and I’ve read one or two literary biographies. Daphne du Maurier’s and Martin Amis’s were the most engrossing. I might give Somerset a whirl after reading this! It was. Engrossing is good. I might add those author’s biographies to my TBR list.